During my 2014 trip to Arizona I encountered two fasciated saguaro cacti (Carnegiea gigantea). The 2016 trip led me to just one. I found it at the Arizona-Sonora Desert Museum on November 7th, eight minutes after I’d photographed the copper ore you saw last time. Rising at the left are the branches of an ocotillo (Fouquieria splendens). Cacti are so amazing. Sometimes they look like stitched, made from fabric or even upholstered. I never thought about the resemblance to upholstery, but I can see it now that you’ve mentioned it. The top of this saguaro isn’t normal, but is caused by fasciation. You can compare it to the top of a normal saguaro. The fact that the trees, the saguaro, and the ocotillo share essentially the same shades of green despite their quite different forms makes the image especially interesting. The contrast between the cactus and the clouds is nice, too. The clouds make the cactus seem even more solid and impassive than it otherwise would. As you’ve pointed out before, fasciation is fascinating — I hope to see an example myself, one day. This fasciated saguaro will stay put for years and I could give you directions to it, assuming you’re willing to drive a thousand miles. You’ve seen the various fasciated plants I’ve shown from central Texas, so there must be some where you are, and now that you go out on the prairie more often, it’s only a matter of time. The texture here is wonderful and the curves at the top remind me of the classic fluted columns with highly decorative Greek capitals at the top. Be nice to see a close-up. We’re on the same wavelength: I also thought about a Greek capital. Maybe someone in Arizona can build a faux-Greek building with columns topped with fasciated saguaro capitals. I didn’t take any close-ups of this fasciated specimen, but you can get a closer look at one I showed from the previous visit. 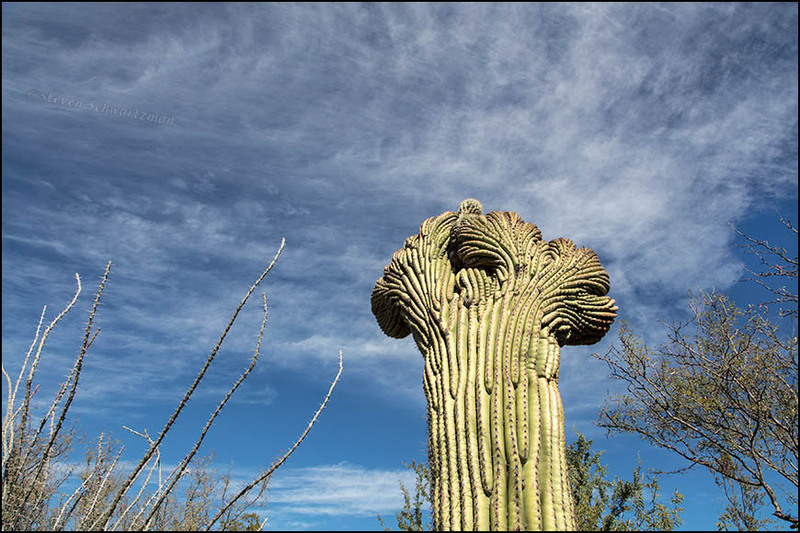 Thank you for the link – that certainly is one fascinating fasciated saguaro! Fasciated saguaros are by far the largest instances of fasciation I’ve ever seen. Most others have measured just a few inches. Saguaros are impressive to begin with, and the fasciation makes this one special. That would make one spectacular design for a column capital. Take *that*, acanthus! A capital idea for a capital column. Acanthus is so démodé.